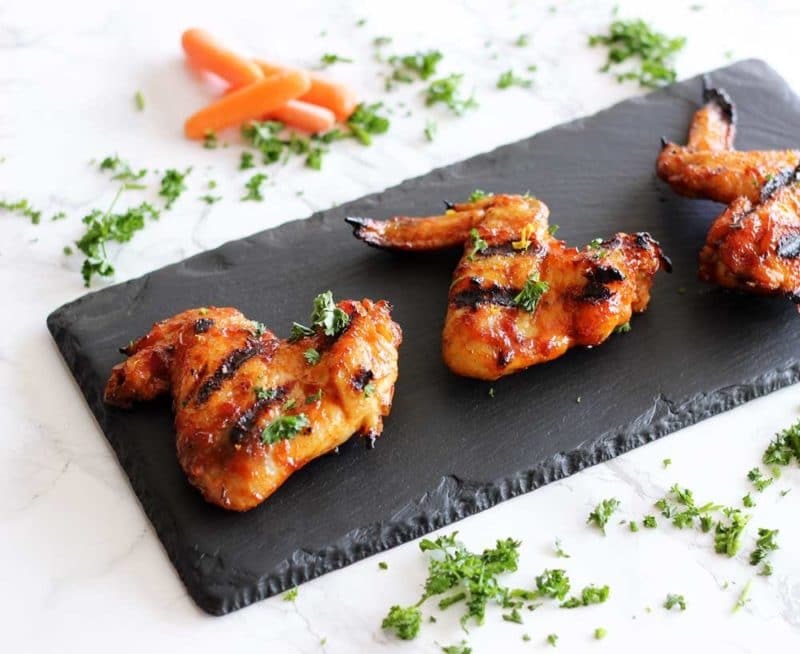 BBQ grilled chicken wings are the perfect grilling food for summertime! 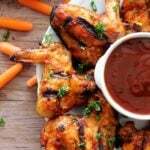 Grilled to perfection in a sweet and smoky homemade BBQ sauce, these wings can be eaten with one hand while holding a cold drink in the other! Perfect for any summer get together and a guaranteed crowd pleaser! This post is brought to you by M&R Specialty Trailers and Trucks, a supporter of really great BBQ this summer! All opinions are entirely my own. It is summertime and that means it’s time to fire up that grill and start BBQ’ing! Or, break out your smoker. Or both…ya’ll I’m smoking meat and grilling all summer! Living in a warm climate has its advantages. I grill and smoke meat year round, but there is just something special about grilling and smoking meat during the summer months. Firing up the barbie and/or smoker just “fits”. 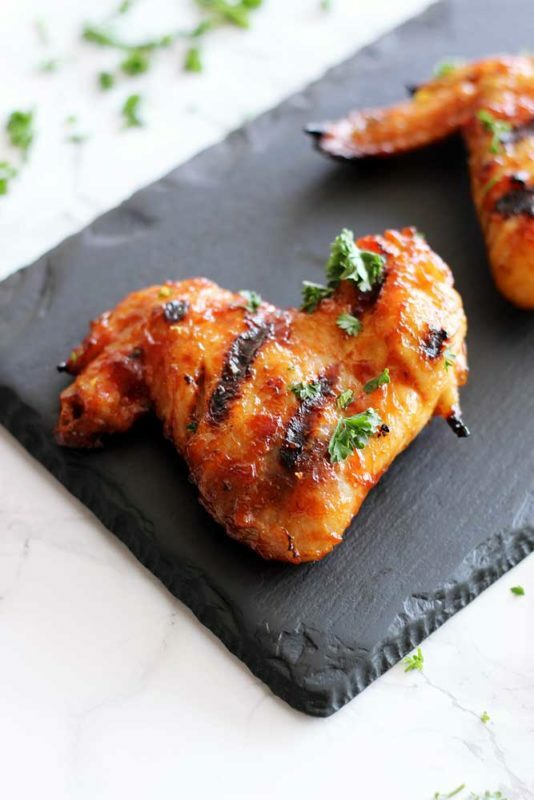 There are so many amazing recipes I’ve created that are perfect for grilling and smoking, like my 10 Garlic Clove Marinated Grilled Filet and my Applewood Smoked Chicken and now, I have a brand new BBQ Grilled Chicken Wings that you are going to fall in love with! The BBQ sauce is homemade and so delish. Can’t decide if you like your BBQ sauce smoky or sweet? Well, I’m going to give you the best of both worlds! This BBQ sauce is on the sweeter side, but my secret to cutting some of the sweetness is to add just enough strong brewed coffee to the BBQ sauce while it’s simmering on the stove. The coffee also adds a bit of smoky flavoring! So, how do I recommend marinating these BBQ chicken wings? Well the “marinating” is all in the prep stage. The prep and set-up for this recipe is simple! 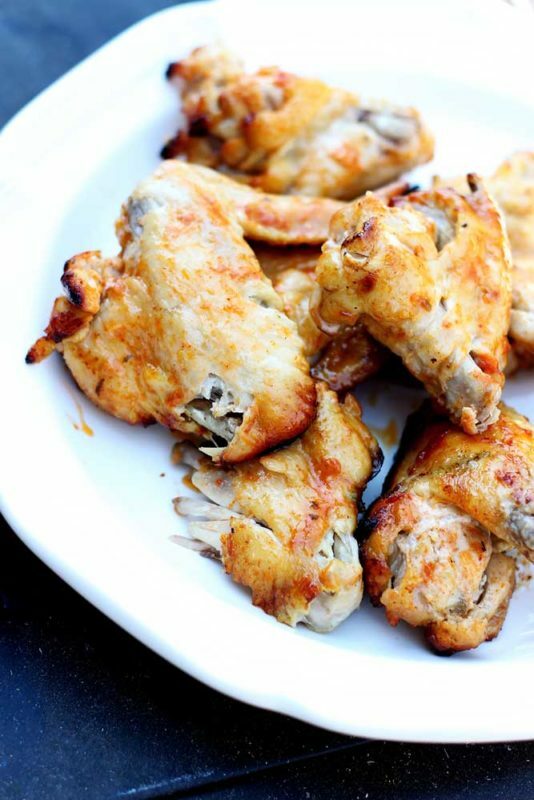 You simply take your chicken wings (regular size wings OR appetizer size wings – both work perfect for this recipe) and you rub them down with a 3 ingredient rub. Then you put them on a flat piece of aluminum foil. You will take your ranch dressing and your BBQ sauce and you will brush it on top of the wings. You’ll want to completely coat the chicken wings on both sides and then you’ll want to take the aluminum foil and fold it into a pocket. 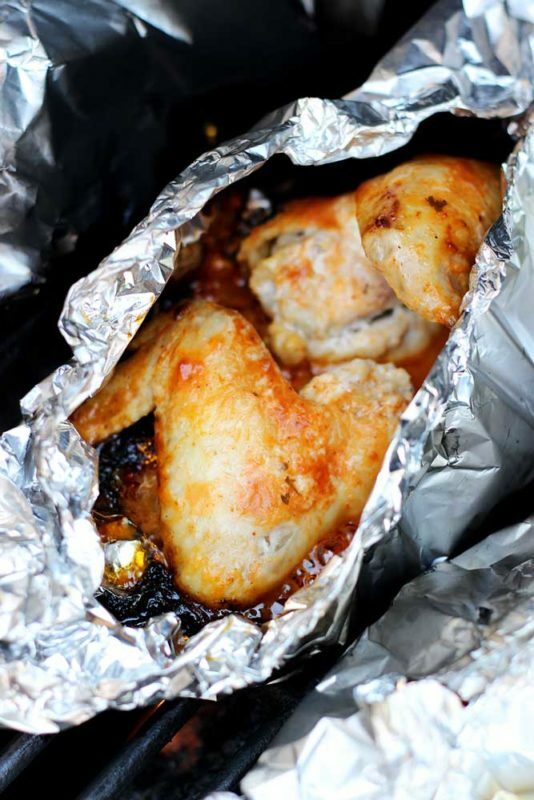 Simply pop the foil pockets onto your grill and let them grill for about 30 minutes. I took a little sneak peak about 25 minutes into grilling these pockets. As you can see, the chicken is starting to reflect that golden grilled appearance and the meat is starting to fall off the bones. Yep, just like that. After about 30 minutes of grilling in the foil pocket with the ranch and BBQ sauce, they are ready to be removed from the pockets and put onto a plate. As you can see in the picture above, the meat is starting to nicely fall off the bone and these wings have that beautiful golden BBQ look. But, we aren’t done just quite yet! You’re going to take the chicken wings and place them back on the grill. You’ll gently brush on the BBQ sauce and let these finish grilling about 5 minutes on each side. You’ll know they’re done based on the the total time they cooked (about 30-40 minutes), the golden color and the grill marks. Looks amazing and tastes SO GOOD! Like I said, you can make this recipe with the appetizer size chicken wings or you can make them with regular sized chicken wings. I’ve done both and the recipe turns out so amazing regardless of the size of the chicken wing! I prefer the bigger chicken wings because they are big, juicy and so flavorful. One thing is for sure…regardless of the size of wing you use, these won’t last long so grab them while they are hot! Summertime is a great season to enjoy the simple things in life. Take the time to hang out with your friends and family. Relax and enjoy the pool. Take the time to grill and/or smoke your favorite BBQ this summer! This recipe is super simple to make, it’s gluten free and I guarantee your friends and family will be raving over these BBQ Grilled Chicken Wings this summer! Happy Eats! BBQ chicken wings are the perfect grilling food for summertime! 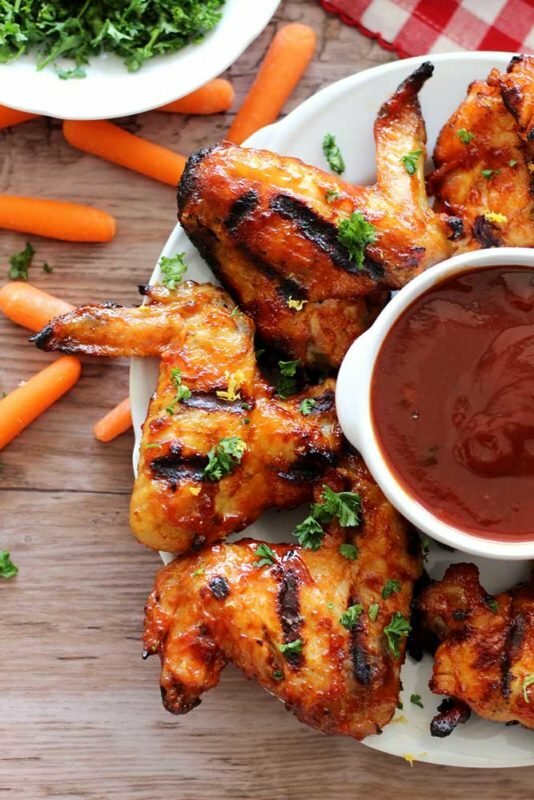 Grilled to perfection in a sweet and smoky homemade BBQ sauce, these wings can be eaten with one hand while holding a cold drink in the other! Perfect for any summer get together and a guaranteed crowd pleaser! Combine all BBQ Sauce ingredients in a saucepan. Stir until mixed well. Simmer together in a saucepan until it starts bubbling. Once the sauce starts to get thick, remove from heat and set aside. In a mixing bowl, combine the fresh minced garlic, cayenne pepper and salt. Gently run the mixture onto each wing. Take a large piece of aluminum foil and place on counter. Place 2 regular sized chicken wings onto the foil (or 4-5 smaller ones). Gently brush on the ranch dressing and the BBQ sauce until the wings are coated on both sides. Fold the aluminum foil on the sides and in the middle until you have an aluminum pockets. Light your grill and when heated, add the foil pockets onto the grill. Grill the chicken wings in the aluminum pockets for 30 minutes, or until the meat is just starting to fall off the bone. Once done, remove the aluminum pockets from the grill and remove the wings and place them on a plate. Toss the aluminum pockets. Take the wings and gently place them back onto the grill. 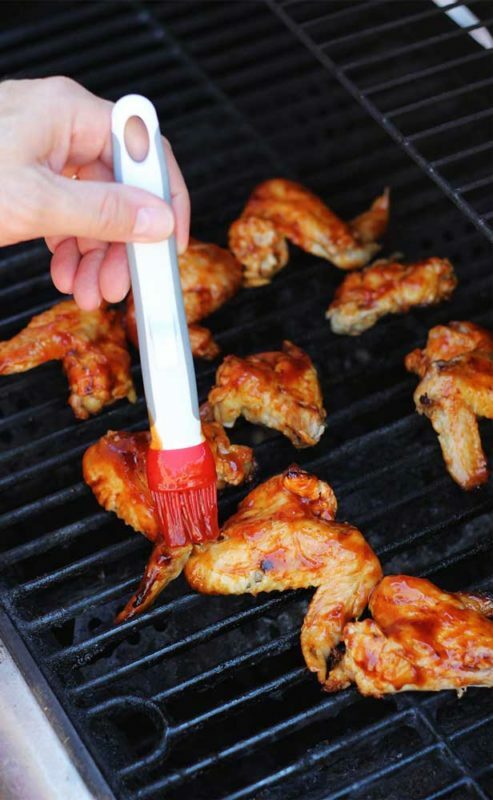 Brush on the BBQ sauce until fully coated. Grill for about 5 minutes on that one side. After 5 minutes, turn the wings over and brush on the BBQ sauce until fully coated. Grill for about 5 minutes on this side. Once done, remove the wings from the grill and place on a plate. Serve immediately with extra BBQ sauce, Ranch dressing and garnish with carrots and celery! Store any leftover BBQ sauce in the refrigerator. 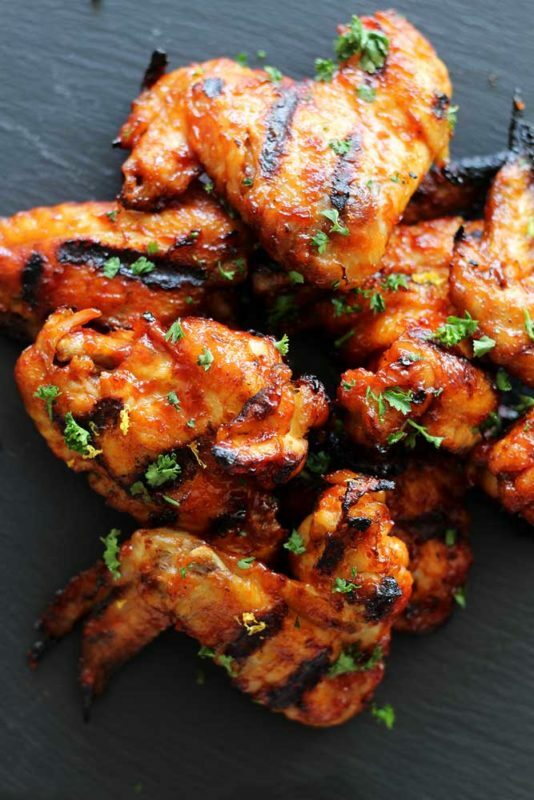 Pin these BBQ Grilled Chicken Wings to your favorite GRILL and BBQ Boards on PINTEREST! BBQ sauce recipe inspired by my dear friend Tyler Bain, the best engineer of software and food! Sooooooooo good! Loved the homemade sauce. These look delicious! And I love the idea of grilling them in the foil pockets first so they don’t dry out! No one likes dry grilled chicken! Thank you!! Yes – these are so moist and I think it’s because I wrap them in the foil pockets. It traps all that moisture in!! Wings are one of my weaknesses. I generally don’t make my own, but do use Alton Brown’s oven recipe on occasion. I might have to give this a whirl.. it looks awesome. These are SO yummy…oh my goodness! Totally work making them yourself!! Let me know how you like them!! My hubby is gonna be one happy man when I show him this recipe. Looks like I know what dinner tonight will be!! These are SO delish! My hubby loves them!! Your hubby will too!! Cheers!